Added a new mode "Riding Skill" that tracks the progress of the study of riding skill for each character. Added tracking daily reward of random battleground. For detail see Battlegrounds section below. Added feature (optional, disabled by default): automatically take up the pledge quests while talking with the Undaunted. The main goal of this addon is to help those players who running daily and weekly tasks for more than one character. Typically, these tasks are quests against the World Bosses, Trials, Pledges and etc. Addon tracks the statuses and cooldowns of such quests for each character and displays information in a convenient visual form. 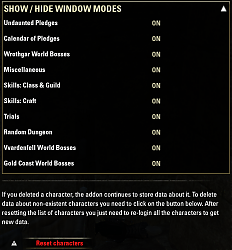 Any of addon's mode/window can be turned on/off separately as well as tracking any of your characters. You can show/hide any mode/window as well as post a message to the chat using the key bindings or slash commands. 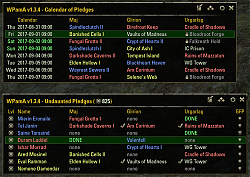 The addon also provides several additional useful features: Raid Group Leader Assistant (RGLA), Calendar of Pledges, a Group's Finder for Pledges (GFP). Displays a calendar of Pledges and allows post to chat message about today's pledges. - Undaunted keys, lockpicks, full and empty grand soulgems, other items. After the Battlegrounds results table was displayed, to start the timer, you need to close the table by pressing the "F" button (or waiting two minutes) and wait for the successful loading of the location where your character will be transferred after the Battlegrounds. Attention! If you log off a character on the Battlegrounds, the timer will not start, and at the next time login on this character instead of time you will see "???". The same situation will occur if the game crashed when the location is loading after the Battlegrounds. Attention! To use this feature you must have the addon AutoInvite! If you have daily quest for World Bosses on Wrothgar, Vvardenfell or Gold Coast, RGLA will help you gather a group. When you click the "Start" button, the addon will set the appropriate quest settings in AutoInvite and turn it on. You don't need to manually set the invite string. Also saves previous configuration of AutoInvite. After a new player joins the group quest shared automatically. Click the "Post" button for select and post predefined (LFM and others) message to chat. When you click the "Stop" button AutoInvite will be stopped and its settings will be restored. In order for this feature to work you need to complete the Trials and get the purple coffer while running the addon. This starts the countdown. If you have a crash the game after getting the coffer information will not be saved. I recommend after getting the coffer to save the information to perform a "/reloadui" or relogin. Instead of dungeons names you can display the names of locations. When Pledge stage is "Return to .." or "Talk to" displays checkmark. Other languages - if you dare to care with the translation. To determine the status "Done" addon remembers time stamp the taking of a pledge and time stamp closing of a pledge. If both the time stamp is between today 6:00 UTC to 6:00 UTC tomorrow then the status "None" is changed to "Done" (if current time < 6:00 then checks between yesterday 6:00 to 6:00 today). Both the time stamp stored in the saved variables. 3. If you took a pledge on the same computer and closed it to another. This is true if you play on multiple computers, for example you have a computer and a laptop. - Your character with a level lower than 45. - Added new option (disabled by default) : show mouse pointer while addon window is open. Code written and provided by OlegS. - Fixed quest name for the Direfrost Keep pledge in EN, DE, FR and JP localization. - Fixed an API-related issue in obtaining information about taken Pledges. - Fixed a RGLA-related error "bad argument #2 to 'string.match' "
- Added a new mode "Riding Skill" that tracks the progress of the study of riding skill for each character. Code written and provided by OlegS. - Fixed a possible API-related issue in obtaining information about a character whose name begins with a lowercase letter. - Reworked code of the "automatically takeup/complete the pledge quests" feature. - Fixed tracking of progress of all Skill Lines. - Added new option for the Random Dungeon activity tracking : the time delay of waiting for information from the game server about the daily reward. - Added new option for the "Calendar" mode - show information about the Monster Set while the mouse is over the dungeon name. - Renamed old "Random Dungeon" mode to new "Random Activity" mode with a new "Battlegrounds" column to track daily reward of random battleground. - Some code refactoring and optimizations. 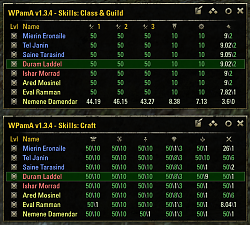 - Fixed width of the "Skills: Craft" mode window. - Added new mode "Skills: Guild" with information about the progress of some Guild skills for each character. - Added information about the Jewelry Craft to the "Skills: Craft" mode. - Updated the "Skills: Class & AvA" mode with information about the progress of all Class skill lines and AvA skill lines. - Updated JP localization, thanks to Marify for help. 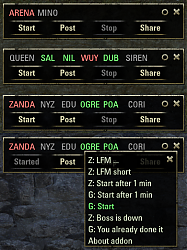 - Added new mode "Summerset World Bosses"
- Reworked code of the RGLA option "RGLA stops if the boss was killed"
- Added the possibility to use addon on both (NA and EU) servers with separate settings for each server. - Canceled the condition "must be in the overworld" for GFP feature. - Added the "scroll" icon in the "Craft" mode for characters are NOT certified in each of the crafting profession. - Fixed a bug using the RU font from the RuESO addon at specific RuESO settings. - Changed the structure of the characters list. 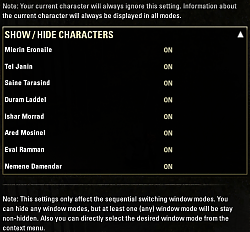 The characters list in the addon fully corresponds to the list from the account (not existing characters are removed from the list automatically). - Fixed typo in the Monster Mask item-link from the Blessed Crucible dungeon. - Changed the number of supported characters. Now the addon can support up to 15 characters. - Added feature: the names of characters that no longer exist on the account will be shown gray colored. - Added the "lock" icon for the locked Trials in the "Trials" mode. The Trial is shown as locked if the account does not have an active ESO+ or the DLC/Chapter containing the Trial dungeon. - Added option (disabled by default) to change the pledges calendar from the regular (8 days) mode to the extended (15 days). - Added option (disabled by default) to set the width of the main window to the same width for all modes instead of a separate width for each mode. - Added a new mode "Seasonal Festivals" that tracks the progress of obtaining festival titles for each character. Code written and provided by OlegS. - Optimized display of text strings in table cells for some localizations. - Fixed tracking the status of the daily reward for the Random Dungeon mode. Code written and provided by OlegS. - Fixed tooltip for Undaunted keys in Miscellaneous mode. - Added more center screen messages for GFP feature. 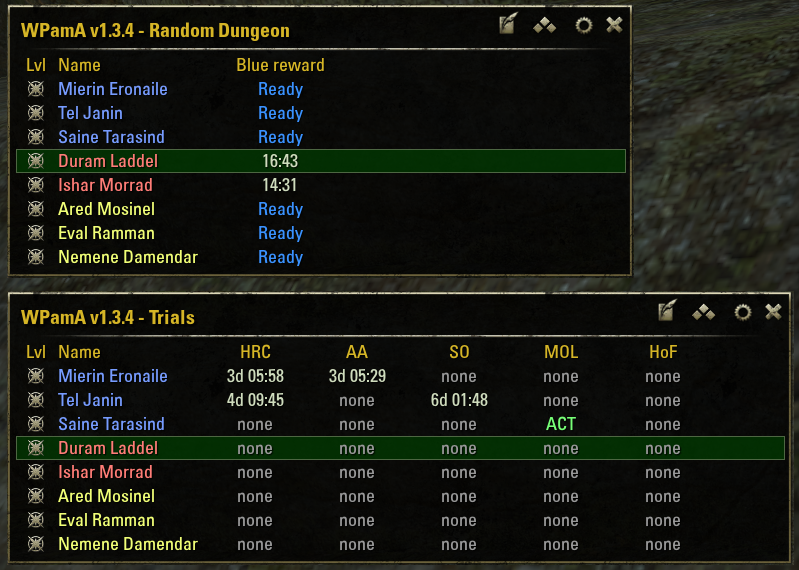 - Renamed the daily reward from "blue" to "purple" for Random Dungeon mode. - Added feature (optional, disabled by default): automatically take up the pledge quests while talking with the Undaunted. Code written and provided by OlegS. - Added information about the number of the Key Fragment items for each character in the Miscellaneous mode. - Added information about the number of items stored in the bank that are tracked in the Miscellaneous mode. - Changed the display format of all currencies in the Miscellaneous mode to better fit to the columns. - Fixed a bug in the sequence of days of the week in the pledges calendar. 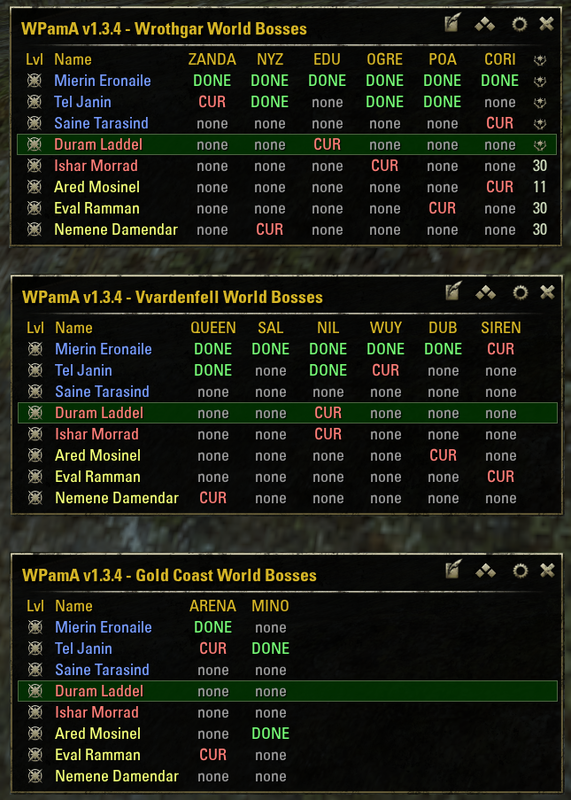 - Added new modes "Vvardenfell World Bosses" and "Gold Coast World Bosses"
- Change Wrothgar Map Zone Index from 367 to 370 (fixed an error "You are not in Wrothgar"). - Fixed center screen messages for GFP feature. - Changed the number of supported characters. Now the addon can support up to 14 characters. - Added compatibility for both Live (2.7.x) and PTS (3.0.x). 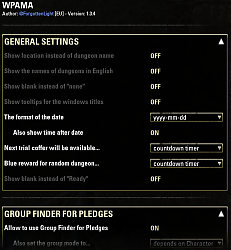 - Added feature (optional, disabled by default, needed key binding): finding group members for running Pledges using in-game Group Finder. Code written and provided by OlegS. - Added information about 4 types of currencies (including Writ Vouchers) for each character in "Miscellaneous" mode. - Added new mode "Random Dungeon" with information about availability of daily/"blue" rewards for random dungeon (a countdown timer or a date & time). - Small fix (Fixed a problem when the data is in the "Calendar" mode can not be displayed when you first open the addon window). 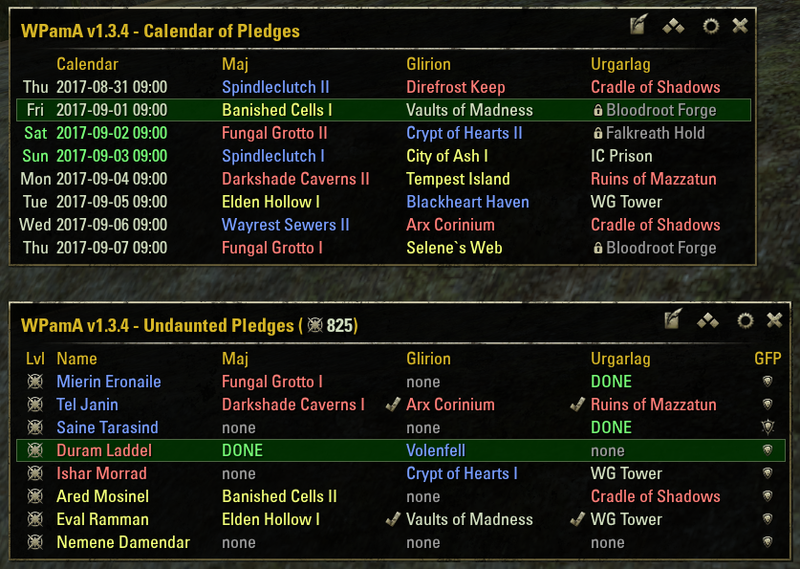 - Added the "lock" icon for the locked dungeons in the "Pledges" and "Calendar" modes. The dungeon is shown as locked if the account does not have an active ESO+ or the DLC containing the dungeon. - Fix error in FR.LUA. 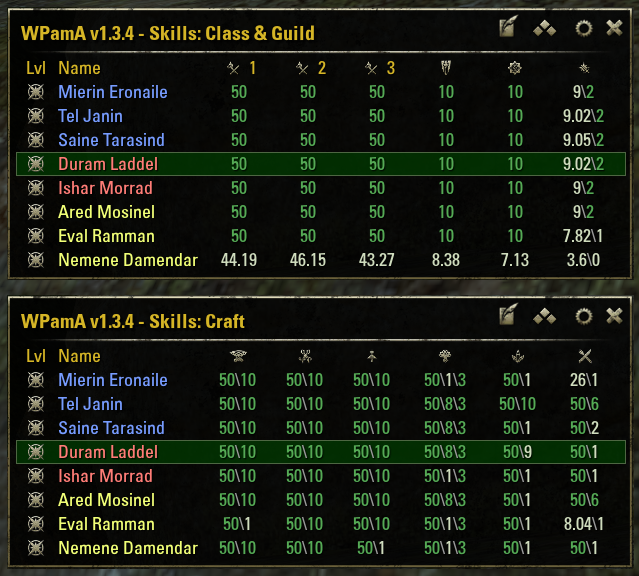 Thx Healdegarde de Winterfell (EU) for report! - Change Wrothgar Map Zone Index from 396 to 367 (fix error "You are not in Wrothgar"). Thx Booblic (EU) for report! - Added 2 new modes: information about the progress of all Craft skills and information about the progress of some Class / Guild skills for each character. - Added option to enable/disable the display of the window modes. You can hide any window modes, but at least one (any) window mode will be stay non-hidden. In any case, you will be able to select the desired window mode directly from the context menu. - Сorrected a modes names and some strings in all localizations. - Added ability to select a window mode from the context menu (by clicking right mouse button on the button "change window mode"). - Added option in the options panel to select display format of date in the calendar mode. - Added option (optional, enabled by default) to display time in addition to date. - Added new design of the addon options panel using LibAddonMenu-2.0 library. The old options window is removed. A new options panel can be found in the main menu of the game client (Settings - Addons - WPamA). 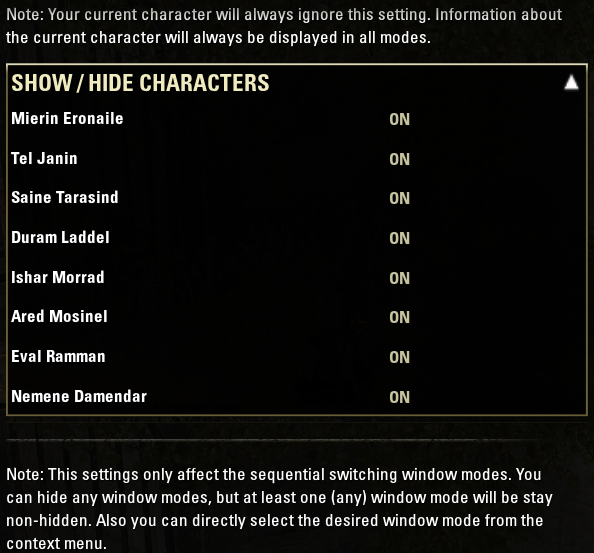 - Added option to enable/disable the display of each character in the addon window. The current character will always be displayed. - Fixed time zone in the calendar mode. Now the time of the change of pledges in the calendar corresponds to the server time. - Added a new cycle of veteran/gold pledges. - Added replacement of constants for Wrothgar World Bosses, if the addon runs on the NA server. - Deep code refactoring and optimizations. - Added new mode "Miscellaneous" with information about a gold/silver/bronze keys, lockpicks, full and empty grand soulgems for each character. - Added tooltips (optional, disabled by default) for windows titles. 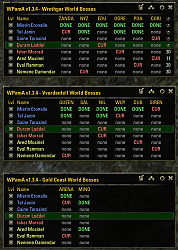 - Added tooltips for column headers of tables in "Miscellaneous" and "Wrothgar World Bosses" modes. - Added feature for tracking the status of Enlightenment. The "champion" icon will be bright white when the character is Enlightened. - Added compatibility for both Live (2.4.x) and PTS (2.5.x). - Changed the number of supported characters. Now the addon can support up to 12 characters. - Changed the "veteran" icon to the "champion" icon for all window modes. - Some fixes and code improvements. - The interface of the addon is modified because of some changes in the API. Now the addon is compatible with both Live (2.3.x) and Dark Brotherhood (2.4.x) patches. - Added feature (optional, enabled by default) : RGLA stops if the boss was killed. - Added the detection of spaces in received invitation's requests . Now the request "pls + zan" (for example) would be processed with sending the invitation. 1. 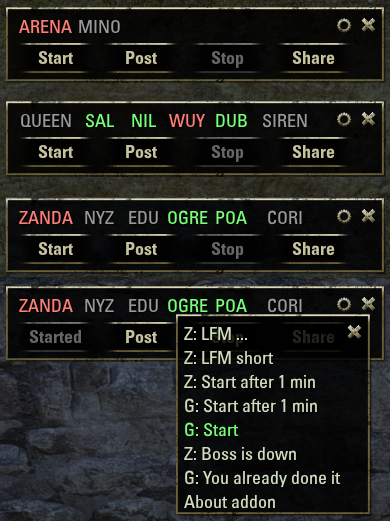 "+zan", "+zanda" or "+dolmen"
- RGLA stops if the group leader was changed. - Changed the method of anchoring the windows. Now they are anchored to the nearest corner of the screen instead of top left. - Added achievements column in Wrothgar Bosses window. It shows how many bosses are left up to the achievement. - Fix FR localization, thx Svan for help! 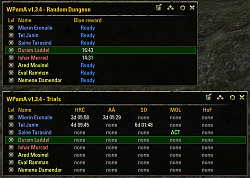 - Fix FR localization (dungeon Darkshade Caverns), thx Svan for report! 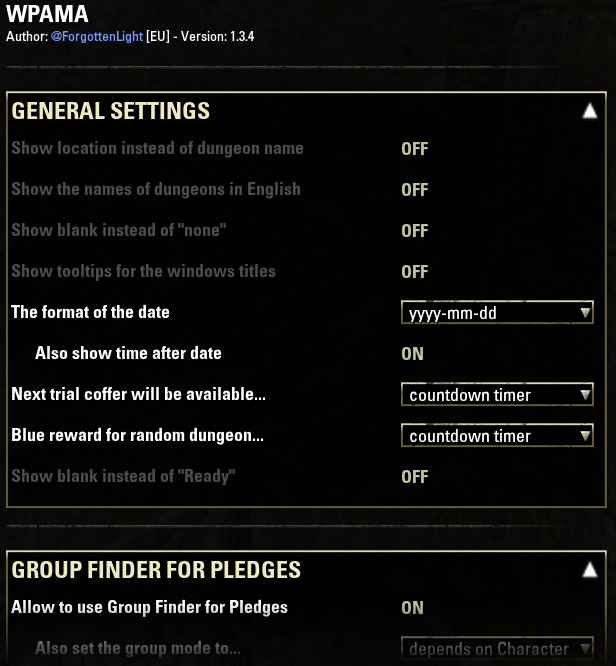 - Added statuses "N/A" and "Done"
Would it be possible to create favorite dungeons (like right click on the dungeon in the calendar and mark as favorite - when marked you see a star near the dungeon name) and whenever this favorite dungeons pledge can be accepted after logging in on a character a centerscreen message will appear as a reminder? Last edited by Gamer1986PAN : 04/19/19 at 07:30 AM. Adding Murkmire? Specifically, adding the world bosses and delves. Really need the updates for the events. Same with Clockwork and Hew's Bane. Thanks for the suggestions, but there is no way to have time to do all this in the near future. 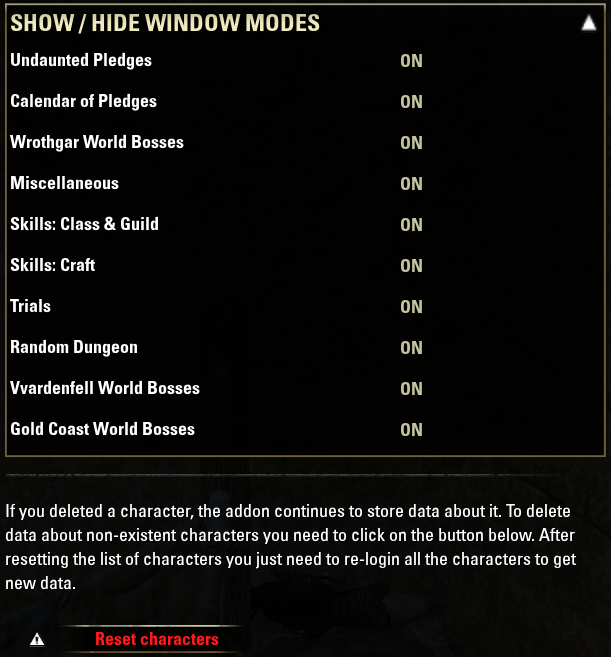 Design of some windows/modes needs to be changed to track the world bosses from Murkmire, Clockwork and Hew's Bane. Adding delves (I think the quests of Bolgrul) makes little sense because these quests are not real daily quests, and any character has the possibility to complete all these quests in one day. We'll do what we can when we can. Last edited by Dueydoodah : 04/12/19 at 01:11 PM. Do the colors in the dungeon calendar mean something? There are dungeons written in yellow, blue and red. Is there any difference? This is a good old question. The colors of the dungeon's names matches the colors of the Alliances that owns the dungeon's locations. Beige color (actually gray) are shown the dungeons at the DLC's locations and Coldharbour. Is it possible to implement auto cursor mode once addon's window is opened? Thanks for the suggestion, and sorry for so a long response. This option will be added in the next WPamA build. I can also confirm the issue. I get the same error. It must have something to do with the latest game patch (4.3.7). Last edited by @DeadSoon : 03/11/19 at 10:03 AM. The workaround is working for now! Some of his character names can be 25 characters or so. Maybe it is best to make the UI itself stretchable from a corner (like drag it or something)? Last edited by Atavus : 03/04/19 at 07:13 AM. I got my friend to try WPAMA but he has a weird naming scheme for his characters. Basically, his names are long and only half of each name is appearing in the window. As a temporary solution, your friend might try this way. It's not the best, but it will help while we are looking for a better way. Please specify how many symbols are in the character names and I'll see what I can do. Last edited by Atavus : 03/03/19 at 01:42 PM.